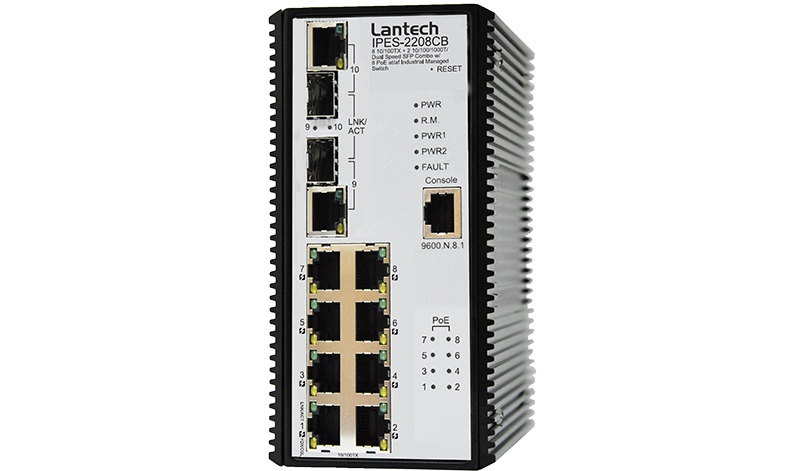 The Lantech IPES-2208CB is a full wire speed 8-port 10/100BaseTX + 2-port 10/100/1000T/Dual Speed SFP Combo industrial PoE switch w/8 POE 802.3at/af Injectors and Pro-Ring IIse and couple ring (Pro-Ring IIm) self-recovery in less than 20ms. The SFP connection is suitable with 100M or 1000M Dual Speed. The advanced SNMP management features include QoS for 4 queues, 802.1q VLAN, IGMP snooping, query and source only for multicast IP surveillance, DDM*** as well as Web Ping, Environmental Monitoring**, SNTP and SMTP etc. Compliant with 802.2at/af PoE Plus standard, the Lantech IPES-2208CB is able to feed each PoE port up to 30 Watts@54 VDC providing the connected PD devices. The built-in relay contact is able to connect with alarm system and send Email, SNMP trap and Syslog alert in case of power or connection failure. IPES-2208CB-12V is built with Booster technology that can accept input voltage from 12V ~ 48V and deliver PoE power at 48V to feed the PD. Lantech IPES-2208CB supports advanced PoE management including PoE detection, delay and scheduling. PoE detection can detect if the connected PD is hanging up then restart the PD; PoE delay is to delay power feeding when the switch is completely booted up; PoE scheduling is to allow pre-set power feeding schedule upon routine time table. The exclusive IGMP source only function can auto choose IGMP query for surveillance application. The innovative Pro-Ring IIse self-recovery scheme can recover single ring network in less than 20ms while Pro-ring IIm for couple ring topology with only one step configuration. Lantech IPES-2208CB builds all the important management features required in large network like DHCP Client/Server, 802.1X authentication, IGMP Query / Snooping / v3 and Source only for reverse multicast flow ,and advanced QoS. It also supports Ping commands via Web to detect whether a specific device is connected for easy trouble-shooting. The built-in factory reset button can restore all setting back to factory default in case of User name and Password are missing. 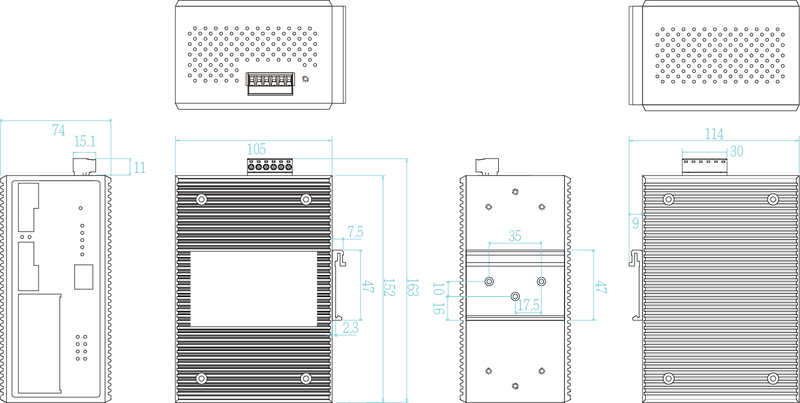 The optional environmental monitoring model can display ambient temperature inside case, Input voltage, current, power consumption, PoE load info at a glance and with capability of alert setting. The Lantech IPES-2208CB can support up to ±6KV ESD contact per UTP port to minimize the burn down risk where the electronic static discharge is usually found. It is the best to be used in municipal, city surveillance, automation, transportation, mining, heavy Industrial factory where needs PoE functionality under harsh environment. The -E model can be used in extreme environments with an operating temperature range of -40°C to 75°C. Embedded 8-port PoE plus to feed power up to 30W@54V. Pro-Ring IIse fos Single-Ring and Pro-ring IIm for couple ring supporting network recovery in less than 20ms up to 50 switches in a ring. 20ms recovery is on fiber port. Supports TFTP and Web firmware update, TFTP backup and restore.